The Calgary Women’s Run turns 40 this month, making it one of the oldest events of its kind in the country, and this avid runner will be there at the start line for the 34th time. Back in the summer of 1979, Mary Madeline White noticed an ad for an upcoming run for women, the first of its kind in Calgary. The nurse and mother of two had been running recreationally for years, but she had never raced, unless you count that one time back in 1943, at the age of four, when her mother entered her in a race for 12-and-unders. “And I won,” laughs the pixie-haired White, now 79. Back in the summer of ’79, however, the idea of racing as an adult seemed intimidating to White. In those days, women were anomalies at running events – even at those events that permitted them to enter, as many did not. White ended up calling the telephone number in the ad anyways. Marg Carleton, the race organizer and a member of the Calgary Roadrunners Club, answered. Intimidating or not, today, of course, women participate in road races in increasing numbers. According to statistics published by Canadian Running magazine in 2016, women accounted for more than half of participants in five-km, 10-km and half-marathon distance categories in Canadian races. Since her first go at the Calgary Women’s Run back in 1979, White has run three full marathons, 26 half-marathons and several hundred races of shorter distances. 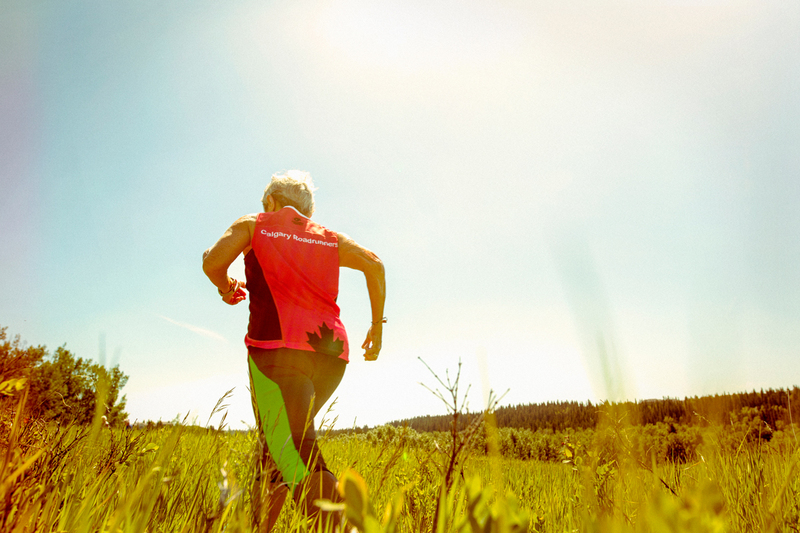 She mostly sticks to half-marathons or shorter now, having run her last full marathon in 2000 at age 62. These days White, who stands just under five feet tall, runs between 20 and 32 kms in a week. She runs outside in the summer and on the treadmill or indoor track in winter, having given up running outdoors in cold temperatures several years ago on the advice of a doctor who said cold air was aggravating her asthma. White also avoids running outside in less-than-ideal air conditions to manage her asthma and always carries an inhaler. Despite her age and respiratory issues, White says her doctors are very supportive of her running and believe it has helped strengthen the cartilage in her knees and kept other health problems at bay. On their recommendation, White takes Vitamin D daily and cycles for five minutes before and after each run. “In my case, asthma and arthritis are just two wee things that are manageable with help and do not interfere with my fun,” she says. White is also a firm believer in the benefits of cross-training. In addition to all the running, she cross-country skis and trains on elliptical exercise machines. She’s also an avid cyclist and is the proud owner of “5.5 bikes” (one is a tandem). When it comes to her diet she describes herself as “not doctrinaire.” She doesn’t eat red meat, having given it up a few years ago (“you could say I’m 95-per cent vegetarian,” she says), and eats her biggest meal in the middle of the day, something she is accustomed to from growing up on a farm. She then has an afternoon snack and a light dinner so she can sleep more easily. Aside from the odd ankle issue, White has mostly stayed injury-free. “It’s not running that hurts people, it’s compulsive behavior. I’m too lazy to run myself into injury,” she says. White’s own approach to running is that it can be complicated – or not. “If you decide you want to run, and something doesn’t feel right or isn’t comfortable, you need to pay attention to it,” she says. “Visit with your doctors, hear them out. Pay attention, take care of yourself, and that’s all there is to it.” She says she still learns something from every race. And sometimes a race will just remind her of things she already knows, like last year when she watched her 10-year-old grandson smile through his first-ever 10-km race. The 40th Annual Calgary Women’s Run takes place Aug. 26, calgaryroadrunners.com.